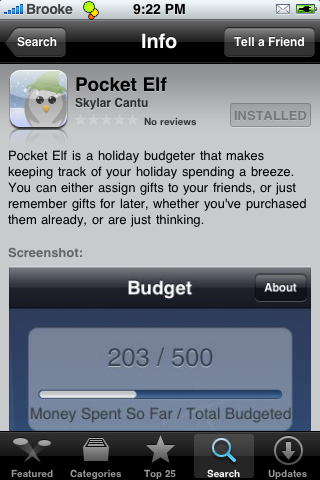 Pocket Elf is an application that allows you to keep track of your Holiday spending! I know, it might still be a little early (though, I have already asked for my families Christmas Lists!! ), but if you are looking for a way to keep yourself on budget this Holiday season this might just be the app for you. It comes from a developer that many of you may be familiar with. Skylar has also developed PocketTouch, a jailbroke application.